The Teenage Mutant Ninja Turtles Are Back! Description: Join Leonardo, Michelangelo, Donatello, and Raphael as they battle evil villains in this Join blKick off your Ninja Turtles themed birthday party with our awesome TMNT themed bounce house. This bounce will be a perfect addition to complete your fully themed birthday party. Be sure to invite Donatello, Leonardo, Michelangelo, and Raphael to eat pizza with you at the party. 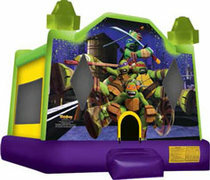 This large 15 x 15 feet bounce house will offer plenty of room for all of the little Ninja Turtles.